Yesterday I showed up at the right place, on the right day and at the right time for my kid’s doctor appointment with an allergy specialist. The only problem? I brought the wrong kid. Her understanding made me feel better for mixing up my own kids and messing up the appointment. A fellow parent knows that some days go down in a blaze of missteps. Mothers often get designated as the family’s “Rememberer-in-Chief.” There’s an underlying expectation that moms will remember not only our own to-do list and appointments but also the kids’ itineraries. We’re also supposed to remember where everything in the house is or might be at any given time. And there are so many other things to keep track of – the name of the paint color we used in the kitchen, the phone number of the plumber, a dozen or so passwords, when to be home for the cable installation, and which charging cord goes with what piece of electronics. Like most people, I use calendars, apps and phone reminders to help carry this mental load, but the main tool I use is “brain folders.” I believe we all have brain folders for different categories in our lives. For example, my husband and kids are in one brain folder labeled “family.” This explains why I often call one kid three different names before I come up with the correct one – “Adam! Tom! Kate! I mean Jack! You there! Get over here and help me for a second.” The kid will roll his eyes in response, but he will understand one day when his brain folders get as crowded as mine. There’s also a brain folder labeled “medical.” On the day of the aforementioned appointment mix-up, I realized that the kid I’d brought to the allergy appointment had a different appointment later that same week with a dermatologist – at an office that’s on the same street with the allergist. It’s easy to see why those two appointments got jumbled up in the same brain folder. Most of the time, I know the information I need is already in my brain – somewhere. The problem is not so much with having the knowledge as it is with accessing it. I read a wonderful novel last summer that explained this predicament so well. The book by Allison Pearson is called “How Hard Could It Be?” and it’s a hilarious story, especially for people past the age of 40. 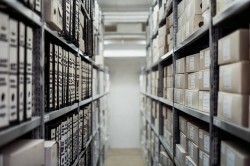 The main character compares her middle-age brain to a vast warehouse of filing cabinets where an older man named Roy works as the retriever of information. She describes Roy as a kindly but slow old guy who wears carpet slippers and shuffles through the rows of files trying to locate the one she needs. Sometimes Roy cooperates and delivers the goods right on time. Sometimes he goes to lunch in Aruba and can’t be bothered. And sometimes Roy just needs a little extra time. He can’t be expected to sprint around the brain warehouse wearing those flip-floppy carpet slippers, especially when that weird pain in his hip flares up again. Roy isn’t as young as he used to be. He’s bound to fumble a few brain folders from time to time.